If you’ve wanted to try out essential oils and a diffuser, now is the time! 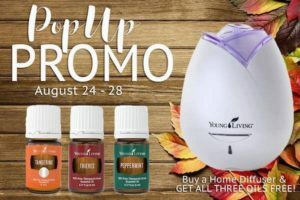 You can buy a Home Diffuser and get 3 oils for FREE! The included essential oils are: Peppermint, Thieves, and Tangerine! This promo is TEMPORARY! Only good through August 28th!!!! Don’t let this opportunity pass you by! Just go here! No enrollment required! However, if you choose to get a starter kit as a wholesale member, you can add this item and get the FREE oils plus receive 24% off of any future purchases.